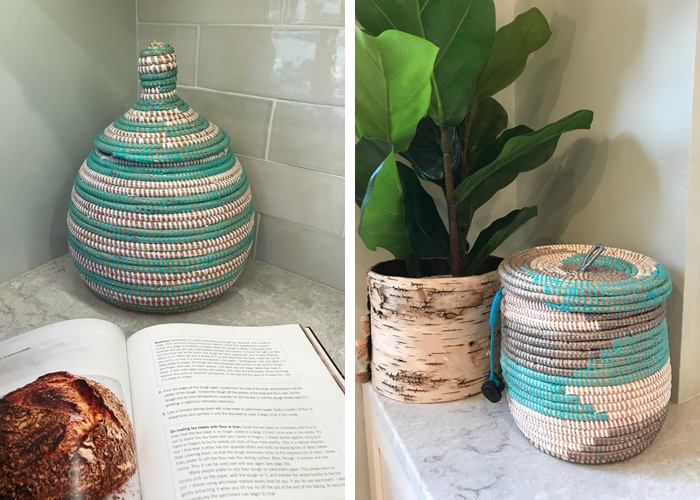 When HumanKind first brought in hand woven baskets from Senegal, I fell in love with their playful use of color and the especially charming “topknot” handle on the domed lidded baskets. That topknot made me smile! It was about the time my husband and I had embarked on a much-needed kitchen remodel, so when it was (finally!) finished, I wanted some decorative but useful elements to give the kitchen personality. Those Senegalese baskets were the perfect touch. They were beautifully made in colors that complemented my new color scheme of gray-green walls (Sherwin Williams "Sea Salt"—tranquil color to calm down our antsy household), white cabinets and gray toned countertops. "And the baskets are not just decorative! We use one to corral all our chargers and headphones, so we always know where to find them. The others just, well, make me smile! When Marie Kondo’s show and book got millions of us to look around our houses for the possessions that "spark joy" I got inspired take her advice to pare down, fold, and simplify. I went room by room sweeping up the un-joyful possessions and emptying and reorganizing closets and drawers. 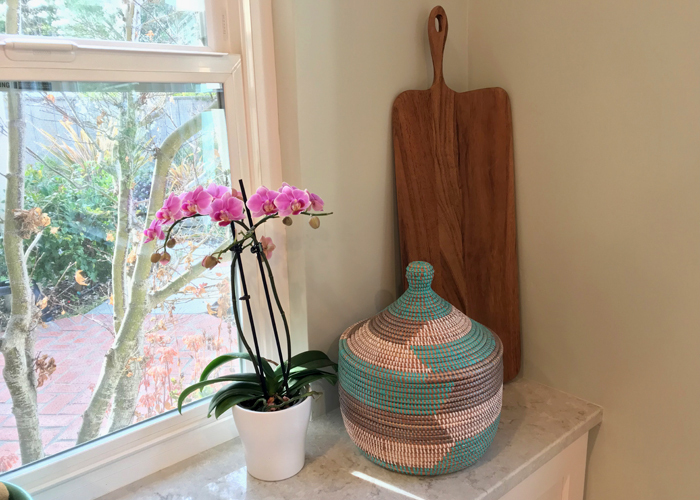 But my Senegalese baskets stay put – they are examples of treasured possessions that add value and satisfaction to our home. I’ve studied the pictures on the website of our fair trade certified supplier Swahili African Modern and seen groups of women working together, some with babies on their laps. 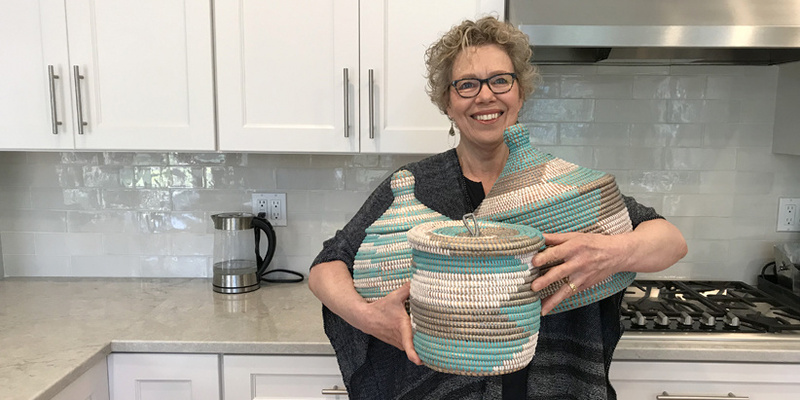 They carefully craft the baskets with cattail grasses and colorful strips of plastic, forming beautiful designs while sharing workspace and skills. 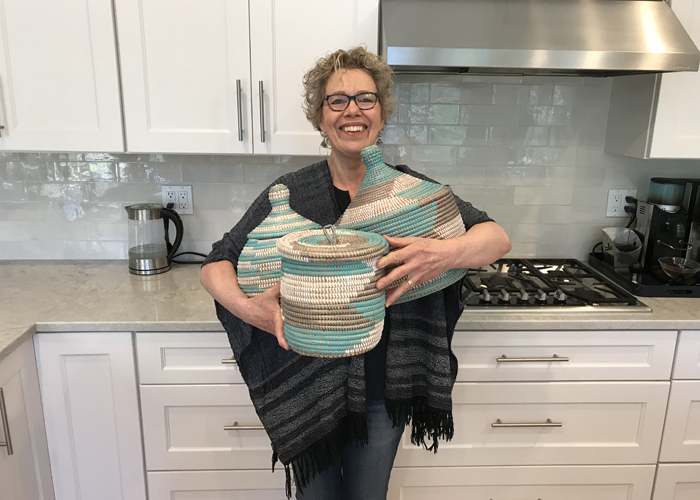 That HumanKind can support their work by bringing these baskets to our town and into my home, well, for me that "sparks joy!" Contact us to find out what colors we have in stock! These baskets are an exclusive in-store product, not available online, but we are happy to ring you up over the phone and ship to you!